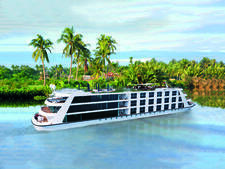 Built in 2017, this sleek and shiny ship is operated by Australia's Evergreen Tours, known in other countries as Emerald Waterways. 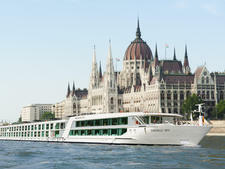 Owned by Scenic, the line benefits from its parent company's expertise and experience in river cruising but at lower prices. Sailing in France's Rhone area, Emerald Liberte is the fifth vessel in the line's Star-Ship fleet but it's 82 feet shorter and carries a maximum 138 instead of 182 passengers. However, it still manages to fit in features such as a resistance pool, cinema, two bars, a massage room, hair salon and 13 bicycles. 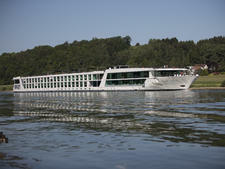 The smaller size is most noticeable in the cabins. 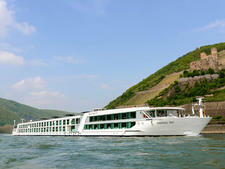 Perfunctory and no-frills, the standard staterooms are a squeeze, the bathrooms even tighter. It's quite cramped for two people, especially if the queen beds are separated into two singles. We also struggled to sleep well as the mattresses are very firm and the pillows are saggy (other passengers liked the beds but agreed some pillows lacked enough filling, which was surprising for brand-new bedding). Mechanical noises also woke us a couple of times. Earplugs can be found in the wardrobe. The ship's other point of difference is it attracts an unexpected breakdown of nationalities. 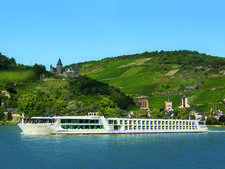 The simple reason is that Liberte's one-week France itineraries appeal to more British and North Americans than the rest of the fleet's longer cruises on the Rhine and Danube, which tend to draw more Australians. With less dominance of one nationality but all English-speaking, Liberte is a great choice for meeting a wider range of fellow travelers. Without doubt one of the ship's best assets is the crew. Unfailingly friendly and professional, everyone from the captain and the cruise director to the wonderful waiters, housekeeping and guest services teams impressed us every day. The food is also commendable, very varied and tasty, and the perfectly fine free wine is regularly topped up too. The bad news for beer lovers is that only one brand (Bitburger Premium) is included. The good news is that beverage packages are reasonably priced. Emerald Liberte will appeal to people who don't want to pay a premium for luxury features such as butlers, unlimited free drinks and fancy decor. But that's not to say it lacks any luxuries at all. Airport transfers, gratuities, most shore excursions, Wi-Fi, and wine and beer with meals are included in the fare. Another treat is Top Chef France's Fabien Morreale joining every cruise to prepare a three-course Provencal dinner. For a first-timer who doesn't know what they're missing from all-inclusive luxury lines, or past passengers who don't need all the extras, Emerald Liberte is a worthy choice. Whatever it lacks is largely counteracted by the relaxed ambience and superb service, which pulls it up several notches. 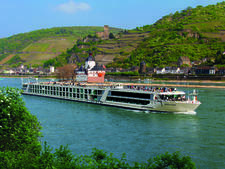 The one-week Southern France itinerary attracts a lot of British passengers, along with Americans, Canadians and Australians, mostly aged in their 60s and 70s. Our cruise also had a couple of Scots, Irish, Welsh and New Zealanders. The dress code is casual during the day ashore and onboard, except during meals, when shorts and flip-flops are not appropriate in the restaurant or terrace. For dinner, it is suggested that men wear collared shirts and trousers; jackets and ties are not required. 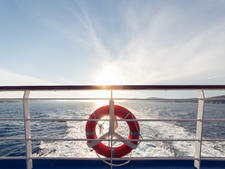 Women can wear dresses or long pants and top, glamming up for the captain's welcome and farewell dinners. There is no formal night. Comfortable, rubber soled shoes are recommended for walking tours. Also bring a hat, sunglasses and jacket or cardigan for cooler weather. 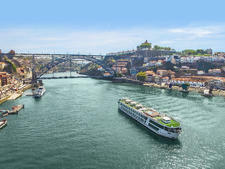 Fares include a transfer from Nice Airport on the day of the cruise departure; all onboard meals; wine, beer and soft drinks during lunch and dinner; tea and coffee; most shore excursions; bicycle hire; Wi-Fi; and gratuities for crew, cruise staff, drivers, tour guides and porters. Passengers in suites receive concierge service, and some free laundry and pressing, depending on the category; passengers in other cabins pay per item for laundry, starting at 1.60 euro for underwear. The mini-bar in the Owner's Suite is restocked daily. Onboard currency is the euro.